This gorgeous recipe has been passed from friend to cousin to Heather Dunlop to me. I don't know where it originated, but I'm so grateful to whoever came up with it. Combine 1/4c Balsamic vinegar, 1T olive oil and 2T brown sugar. Drain and quarter whole peeled tomatoes. Add tomatoes (and capers if using) to the vinegar mixture and stir together. Cut chicken fillets in half and marinate in tomato mixture for at least 30 minutes. Lay eggplant rounds on a baking tray lined with baking parchment. 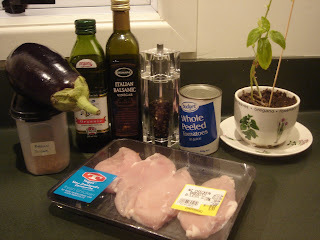 Scoop chicken pieces out of marinade and place one on each eggplant round. Spoon the rest of the marinade over the top of the chicken and bake in oven for 20-25 minutes. Serve on rice, couscous or quinoa, and garnish with basil leaves. Served this recipe to friends Ranald & Sue Mcintosh tonight. They loved it, as did Laury and I and Sue's 12 year old granddaughter Briahn. See picture on my Facebook page. Hey Emma, we were lucky enough to try this on Saturday night when your Dad made it for us!!! Such a treat (both the dinner and having it made for us). We really enjoyed it. 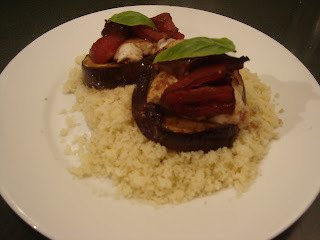 Kris is not so keen on eggplant but enjoyed it and is keen to make this recipe again. Yum, just made this for dinner tonight. Added a wee bit of parmesan cheese on top too. Was delish although the kids aren't fans of the eggplant so I had to finish theirs off....oh well, waste not want not I always say! Yeah, Paul doesn't really like eggplant either so I usually finish his. Parmesan was a good idea - I'll have to try that next time.